Hi friends! 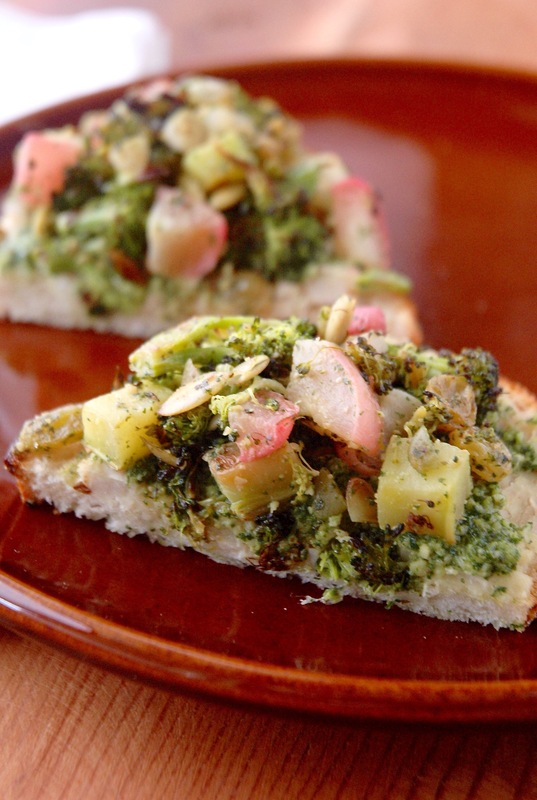 Let’s talk about these Broccoli & Radish Toasts I made earlier this week, because they are so so so good. We had them for dinner and then for lunch leftover the next day. I am NOT above having toast for lunch or even dinner, especially these, because they are so hearty and satisfying! The fact that all of these components can be made in advance and assembled when you’re ready to E.A.T. is the real seller though. Worth it 100%. You could probably even make these in your office kitchen if you wanted to. Just bring all the components and assemble on site. You’ll want to wait to toast the bread until just before assembling though so it’s nice and toasty fresh. I had a whole bunch of fresh mint that I only used a tiny bit for to make another dish, and I didn’t want it to go to waste. Pro tip: Whenever you’ve got ANY fresh herb that you want to save, make.a.pesto. It will keep for at least a week in the fridge, and it’s an instant flavor pop to any dish. Pesto tossed with hot pasta… pesto smeared on toast (like in this recipe! )… pesto dolloped on some fried eggs…? Yes please, sign me up! Point is, if you’re worried about not knowing what to do with that plethora of mint (or parsley, or basil, or cilantro!, etc etc) you’ve got, blend it up into pesto. BONUS: it even freezes well. Just portion it into an ice cube tray lined with plastic wrap until frozen, pop those babies out and transfer to a sealed container. That way, 1-2tbsp sized portions are ready for you whenever you need ’em. I don’t freeze much pesto because we usually eat it up quickly. But, just know that you can! Pesto power. Okay, so, small secret over here but one time I made these amazing quesadillas with smashed white beans and kale and was instantly obsessed. We make these quesadillas all the time. No, seriously: all the time. I don’t even really like quesadillas that much. I’d much rather eat a taco or a burrito, but these, well, these just keep us comin’ back. All the time. So, thank you for this recipe, Running to the Kitchen. I am forever in your debt. I make different variations of these smashed white beans all the time. They are quick to whip up, rich and hearty, and tasty to boot! So, as you can imagine, I was super excited about how well they worked in these toasts. Score! I really hope you guys like these toasts as much as we do. 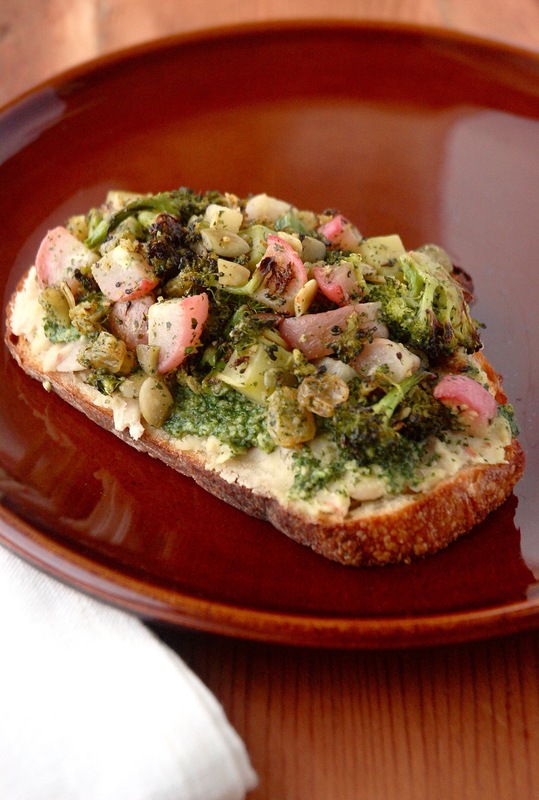 Up your toast game with these flavor-packed and hearty vegetarian toasts featuring broccoli, radish, mint pesto and smashed white beans. PREP: Slice bread. Roughly chop mint. Grate cheese. Roughly chop cashews and pumpkin seeds. Zest lemon. 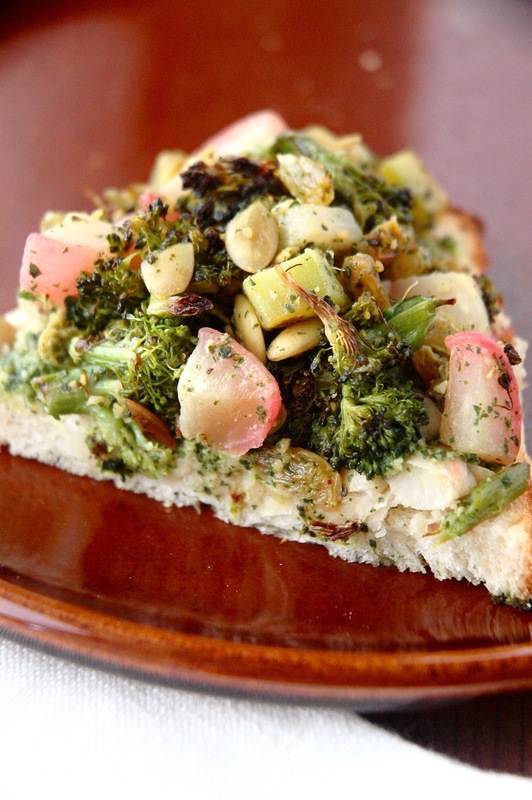 Chop broccoli and radishes into small pieces. Rinse and drain white beans. Mince shallot and garlic clove. MAKE MINT PESTO: In a food processor, add mint, cheese, cashews, lemon juice and zest. Pulse until pesto starts to form. Drizzle in olive oil and blend a bit more until the consistency is smooth. Season with salt and pepper to taste. MAKE BROCCOLI & RADISH MIXTURE: Preheat oven to 425 degrees. Toss broccoli, radishes and red pepper flakes with 1 tbsp olive oil in a bowl. Place on a baking sheet and roast in the oven for 10-15 minutes. Remove from oven, toss with golden raisins, put back into oven and cook for 5 minutes more. Broccoli and radishes should be cooked through and slightly charred. Set aside. MAKE SMASHED WHITE BEANS: Heat 1 tbsp olive oil in a large skillet over medium heat. Add garlic, shallots, red pepper flakes and cook for 3-4 minutes stirring often. Add beans, and stir to combine. Season with salt and pepper to taste and cook until beans are warmed through and soft. Remove from heat and place into a bowl. Roughly mash with a fork. TOAST BREAD: Brush both sides of bread slices with olive oil and place onto a baking sheet. Toast for 6-8 minutes until golden brown. Remove from oven and let cool a bit. ASSEMBLE: Spread Smashed White Beans onto each bread slice in a thin even layer (about 2 tbsp). Layer on about 1 tbsp Mint Pesto. Top with 1/2 cup Broccoli & Radish Mixture. Bake in the oven until everything is warmed through, about 5 minutes. Remove toasts from oven, cut in half and serve. 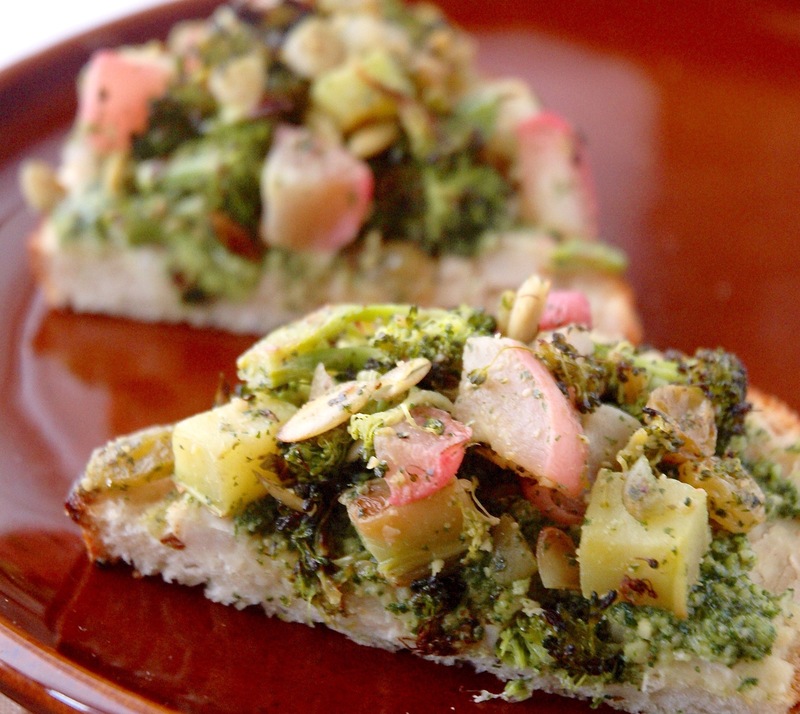 Make ahead: Mint Pesto, Broccoli & Radish Mixture and Smashed White Beans can all be made in advance. Refrigerate separately in airtight containers for up to 4 days. You will have leftover Mint Pesto. It should keep in the fridge for a week, or freeze it.